This is a broad based program in Practical Electricity. 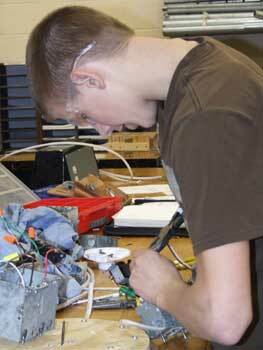 Students are taught safety, as well as installing electrical wiring, lighting equipment, switch gear, motors and motor controls. In addition, they are trained in preparing and reading sketches, diagrams and blueprints. Other skills include: measure, cut, bend, thread, install and assemble conduits, using such tools as the hacksaw; pipe threader; and conduit bender. 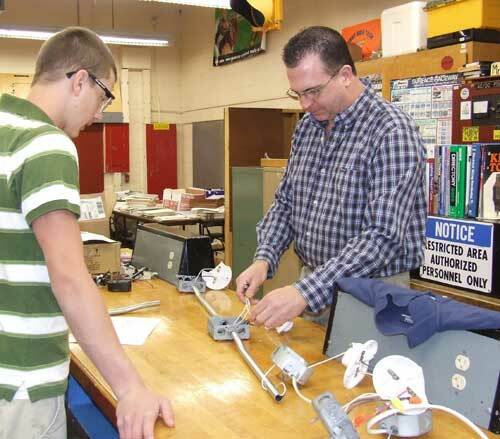 In addition, students learn to splice wire and tape terminal caps; connect wiring to lighting fixtures and power equipment with hand tools and install control & distribution apparatus such as switches, relays and circuit breakers. They are also trained to repair faulty equipment and test electrical characteristics such as voltage and resistance, using voltmeters, ammeters, and ohmmeters. Starting in 2009-2010 school year, the following topics will be added: Voice distribution; Data distribution; Video distribution; Multi room Audio/Video Distribution; Scene lighting control and Surveillance and security networking. The electrical field continues to grow. Projected growth from 2000 to 2012 is 21-35%, with 154,000 new jobs available in the field. The 2003 hourly rate wage range was $12.00 - $33.00. "My experience in Electrical Construction has been very great and knowledgeable. I came in to this shop with no knowledge of electrical operations. Now, I have learned everything from how to wire up switches and outlets to bending & threading electrical pipe. This shop was a great choice for me." "I came to Mr. Eichler?s shop knowing nothing about the electrical field. Every day, I learn electrical and soft skills. 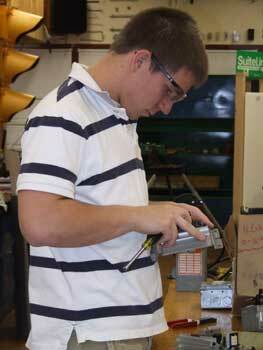 West Side CTC has provided a comfortable working environment in shop and my academic classes. I am also looking forward to Co-Op in my senior year."